Thomas Ake in his farm. He is a cacao farmer in Cote d'Ivoire. It was in the 1970s that Cote d’Ivoire began to establish itself as a powerhouse for cacao production. It currently leads the world in both production and exportation of cacao beans. 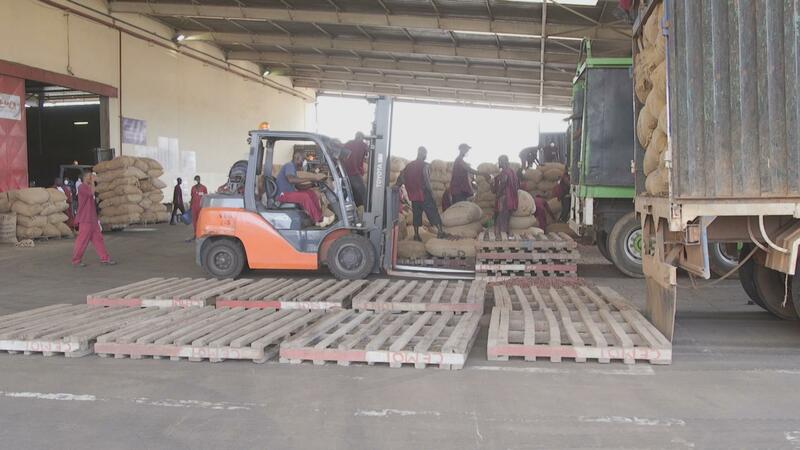 Cote d’Ivoire is highly dependent on cocoa, which accounts to about forty percent of the national export income and ten percent gross domestic income. They are mostly grown in areas with good soils and humid temperatures of the tropics. Thomas Ake in his farm. He is a cacao farmer in Cote d’Ivoire. Cocoa farming is predominant in West Africa, supplying two thirds of the world’s cocoa, with Cote d’Ivoire leading with a production of 1.8 million tons as of 2017. “Cote d’Ivoire is a high producer of cocoa due to the hard work of its population,” says Innocent Youte, Member of Parliament. Grown mostly by smallholder farmers, this is a main source of income for people living in Abidjan, like Nonsan Thomas Ake. He is a cacao farmer who inherited cocoa farms from his parents. 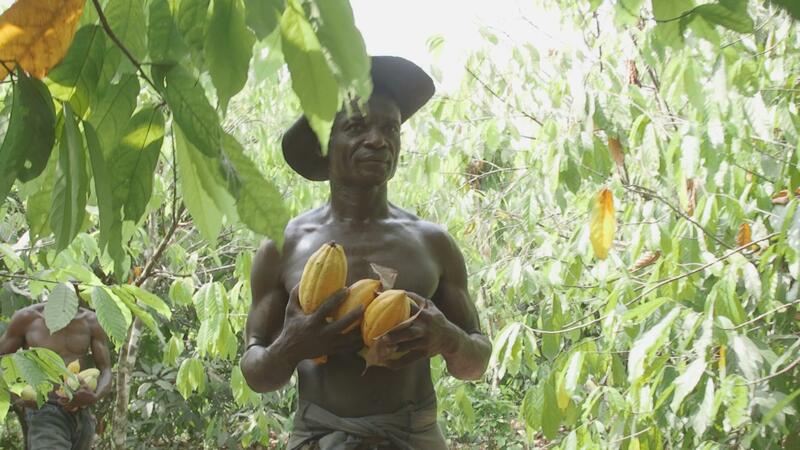 “Planting cocoa is a culture we inherited from our parents, which means it’s in our blood,” says Thomas. Thomas sorting out cacao beans. Thomas owns three and a half hectares of land covered with one thousand seven hundred trees, giving him a return supply of a million cacao beans annually. He harvests the ripe pods that contain the cacao beans, opens to separate the seeds from the outer rind by hand, and then ferments them in order to develop the chocolate flavour. The longer the cacao beans ferment, the stronger the aroma. He then sundries them allowing the acetic acids in the cacao beans to evaporate, thereby reducing the bitter flavours. From the farm, companies like Cemoi purchase the beans for the manufacture of chocolate. Having sourced cacao beans from Cote d’Ivoire since the 1970s, Cemoi opened a cocoa processing factory, targeting West Africa’s growing middle class consumer market. 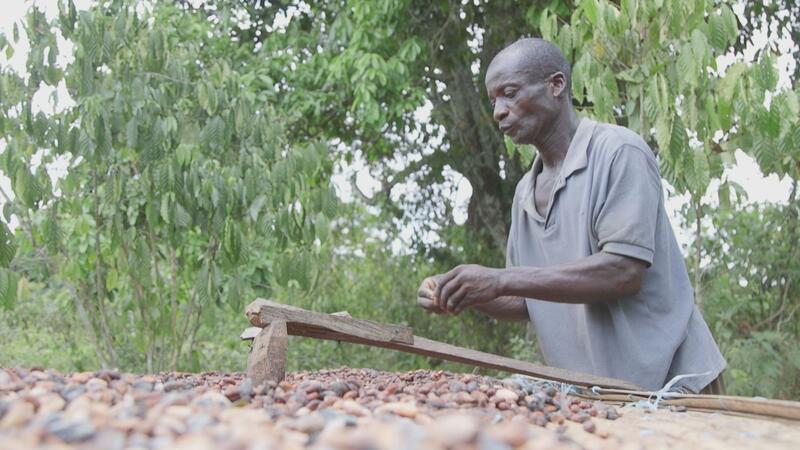 “The cocoa represents a great focus for Cote d’Ivoire on where we are now. The cocoa represents a great deal of our economy,” says Raphael Konan, Cemoi marketing manager. When Thomas leaves Abidjan to visit Cemoi, he’s amazed at how valuable his farm produce are. Where he comes from, rural shops don’t sell chocolate because it’s expensive. Cemoi factory in Cote d’Ivoire. They make chocolate from cocoa beans. One cannot fail to see that these farmers sit at the bottom of the supply chain; receiving the least profit among the distributors, manufacturers and exporters. On his tour, Thomas meets George, a mechanical engineer at the factory who takes him around the factory. Thomas sees how the cacao beans are melted and processed to become chocolate. Back home, it’s unimaginable that the farmers have never tasted the end product of their cacao beans, which are the primary ingredients in chocolate. 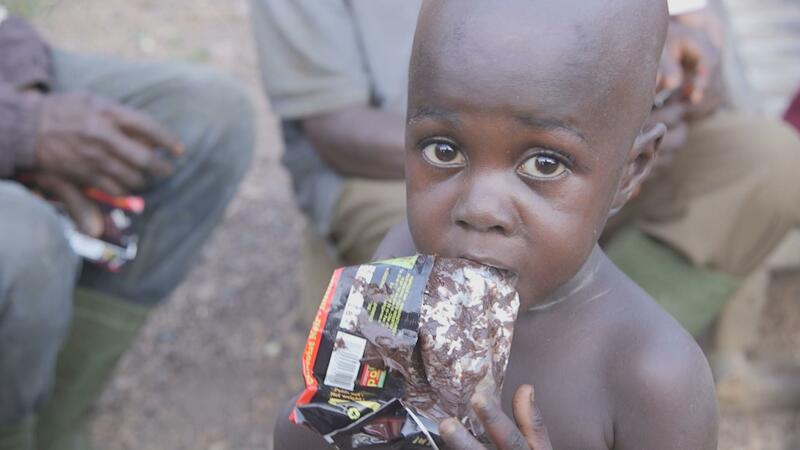 One of the cacao farmers’ child enjoying chocolate. Most cacao farmers in Cote d’Ivoire have never tasted chocolate. Seeing their reaction tasting chocolate for the first time is heart-warming. “C’est très doux” meaning ‘it is very sweet!’ is all they can say. Thomas hopes that the family‘s noble heritage of farming cacao will be passed down to his sons, thereby guaranteeing economic prosperity for future generations in the cacao rich nation of Cote d’Ivoire.